So I disappeared for a few (okay, several) days there. 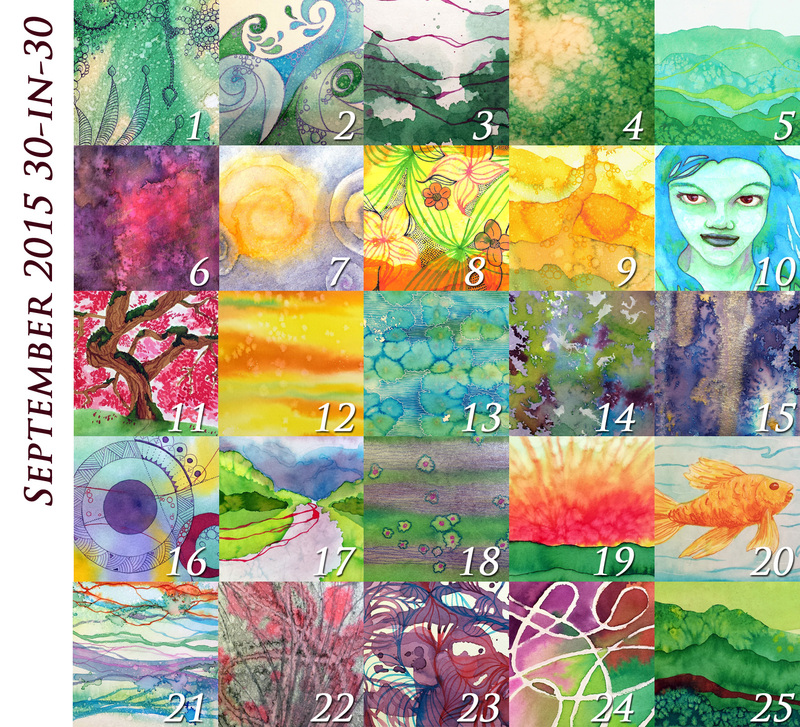 I was still painting, but not with the verve that I started the month off with. Not sure what happened. I did have a bit of an art block but it wasn’t much of one. I’d fallen far enough behind that I ended up only completing 25 paintings total, which is fine in the long run. I’ve also created a collage image of those 25 paintings but I’ll post that as part of a summary post wrapping up the challenge. 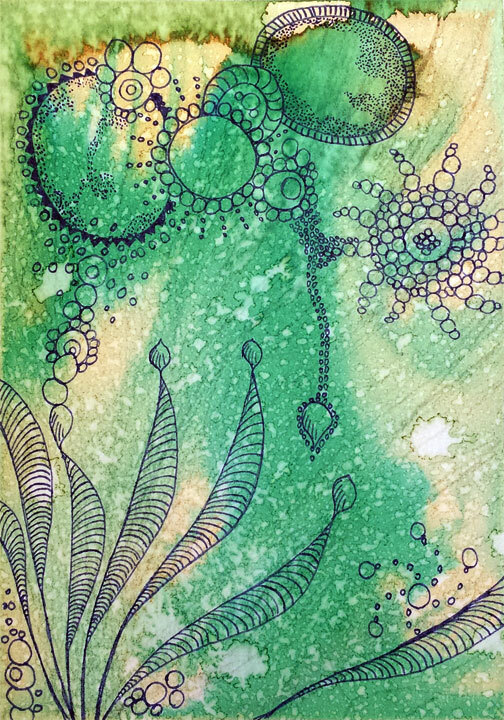 This entry was posted in Art and tagged 30-in-30, Abstract, Ink, Pen, Watercolors on October 2, 2015 by Lori. And here is today’s piece. I did it at the same time as “Flow” from day 12 but I added lavender bath salts to create a larger texture on the page (and make it smell like lavender!). I then decided to outline those areas and fill in the background space with lines, using white ink. I let myself not be perfect here since usually I’d be trying my hardest to make sure all those lines were as straight as possible. The piece reminds me of lily pads on water. I really like how this turned out, especially with the addition of the ink. This entry was posted in Art and tagged 30-in-30, Abstract, Ink, Watercolors on September 13, 2015 by Lori. 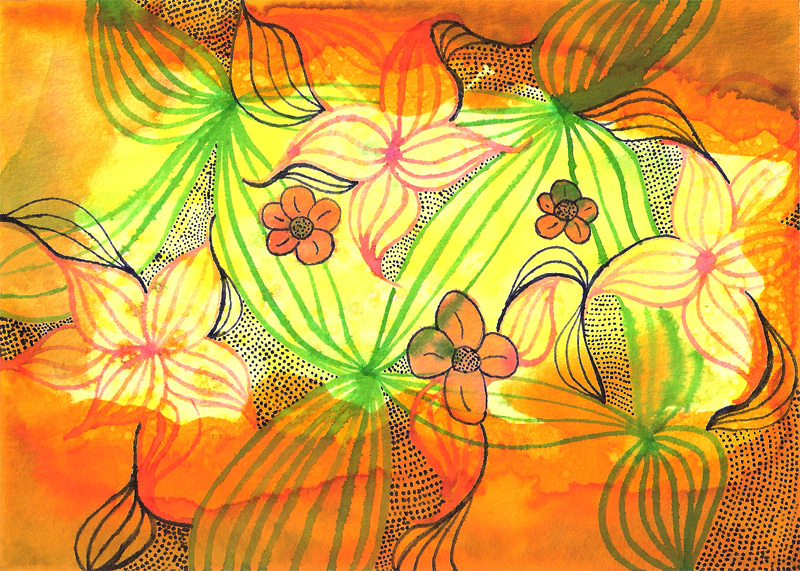 Another piece based on yellows and oranges, but even still, I had to include some greens in there, too. Couldn’t resist! Part of my untitled landscapey series, which I’ve yet to find a name for. 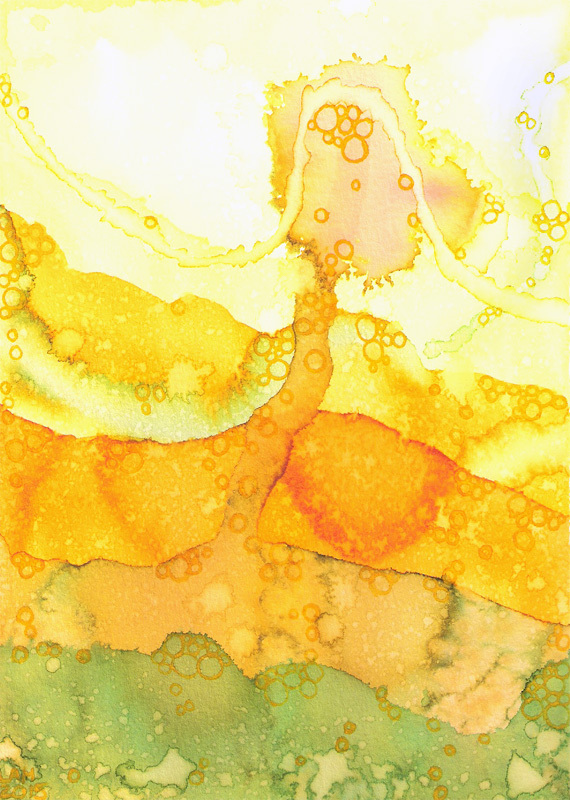 I felt this one needed the addition of circles in yellow ink, but they aren’t quite so prominent as in the scanned image, plus the top section isn’t nearly so light and washed out in reality. This entry was posted in Art and tagged 30-in-30, Abstract, Ink, Watercolors on September 9, 2015 by Lori. I decided to switch from the blues and greens I’d been using and go with something more fall-like. 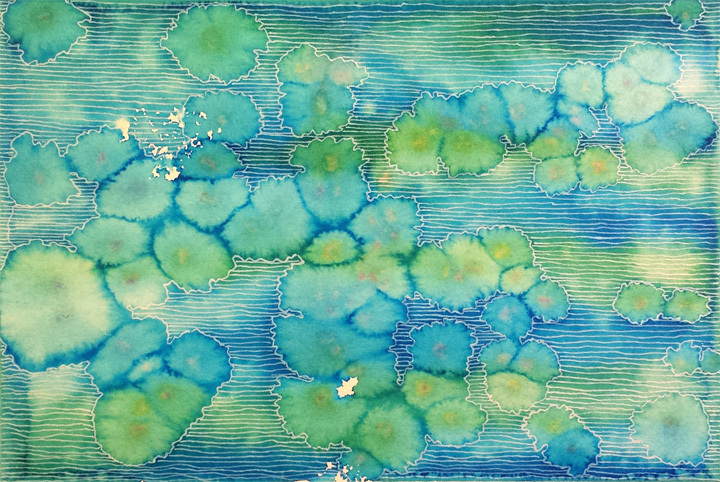 I had no plan in mind with this, so when I started adding the lines that became the flowers, it didn’t feel complete. This time, adding the blue ink lines and dots fit perfectly and I really like how the piece turned out. Now if I could only get my scanner to behave; everything ends up looking dull and washed out. This entry was posted in Art and tagged 30-in-30, Abstract, Ink, Watercolors on September 8, 2015 by Lori. I already have day 2 completed (I work on multiple pieces at once) and day 3 is in progress. Hopefully this weekend I can work ahead a bit, too. This entry was posted in Art and tagged 30-in-30, Abstract, Ink, Watercolors on September 1, 2015 by Lori.